Source: National Human Genome Research Institute, 2013. In 2013, the Human Genome Project celebrates its 10-year anniversary with a new exhibit at the National Smithsonian Museum. In addition, the exhibit will feature the 60th anniversary of the discovery of the DNA's double helix by Drs. James D. Watson and Francis Crick. "The completed sequence of the human genome gave us the first glimpse of the massive instruction book that orchestrates all the complexities of human biology. We want to help the public see how the Human Genome Project has given birth to a modern era of genomics, expanding our knowledge of the human body in health and disease, and our understanding of biodiversity in the natural world. What better place to explore genomics than the Smithsonian's National Museum of Natural History where a personal introduction to the human genome will illustrate the likely impact of genomics on our future?" -- Eric D. Green, M.D., Ph.D. 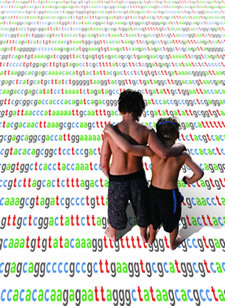 Source: NHGRI collaborates with Smithsonian to produce new genome exhibit, NIH News, May 21, 2012.